Whether you're travelling for business or pleasure, planning the journey is essential. Relying on half-seen signposts, garbled radio traffic alerts and a deity of your choosing means you risk (a) getting lost, (b) getting angry, or (c) getting lost and angry. 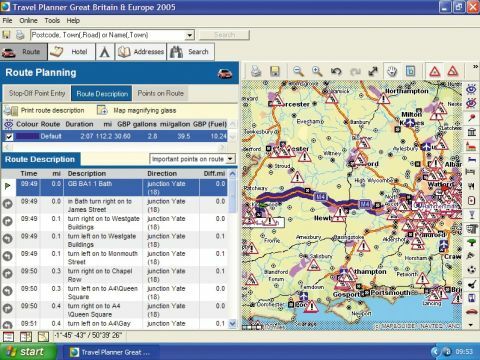 Travel Planner 2005 aims to put a stop to all this randomness by enabling you to draw up a detailed road map that'll take you to and from a postcode (if UK-based) or picturesque town (if on the continent or Mediterranean). The route planning aspect is straightforward. Enter the details in the start and end boxes, supplying as much or as little information as you want to, and click 'Calculate Route'. This produces the most obvious itinerary, which you're able to tweak by including/avoiding certain locations/features. The results can be displayed with varying levels of detail, and if you're unsure of your route you can zoom in onto individual roads. The program doesn't stop there, though. Brief traffic reports can be downloaded and applied to your planned route, warning you of possible delays. Another impressive feature is the ability to search for a raft of leisure venues and touristfriendly locations. You can either make this specific to your chosen route or just treat Europe as your fantasy holiday destination, looking for places of interest up and down the land. Less successful was the attempt by Map & Guide to integrate a hotelbooking element to the program. The engine uses two recognised hotel booking systems, but it was hit and miss whether you could reserve a room online. Occasionally, the booking screens would display in German - not particularly helpful.